We are proud to present our growing list of screenings and outreach in high schools, colleges and universities! Yes, Ben Stern, is 97! And yes his daughter Charlene and he are still working to bring his message of courage, kindness and hope to the world’s next generation with Near Normal Man screening events. There’s so much good that’s happening, here are a number of events happening in the next six weeks! Vacaville screening on March 3, 2019. 300+ public audience of students and adults at the Chabad Center for Jewish Life. Screening at Mt Eden High School, March 27-28, 2019. 800 students in 2 days! 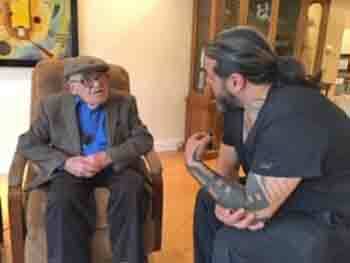 “Lest We Forget”: Ben Stern with Luigi Toscano deep in conversation in German and English. Monday, April 29, 2019 5:30pm. 2050 Center Street Berkeley, CA. In the Simon Wiesenthal Center/Museum of Tolerance, 9786 West Pico Blvd. 10:00am. After the ceremony, Near Normal Man will be screened in the Peltz Theatre at the Museum of Tolerance at 11:15 a.m. followed by conversation with the audience. Thursday, May 9, 2019, 12:00 pm., 100 Larkin St. San Francisco, 94102 (415) 557-4400. Charlene Stern has been invited by a team of German students at Englisches Institut, enrolled in an international, in-depth, BEAM learning experience. They selected Near Normal Man as their project. I will be leading two screening events of Near Normal Man and conversation, with audiences that include all 10 public and private high schools in Heidelberg and the public. 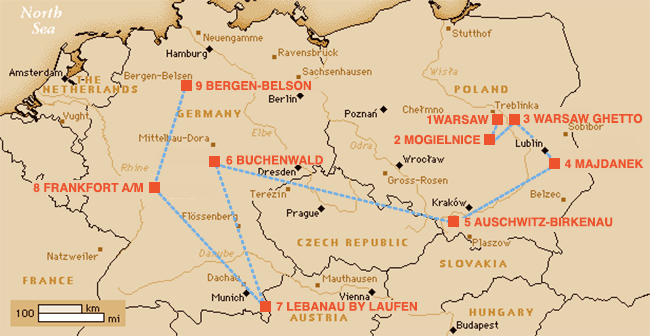 Co-sponsored by Englisches Institut, private high school, and DAI, a German-American Institute. Thursday, October 4. 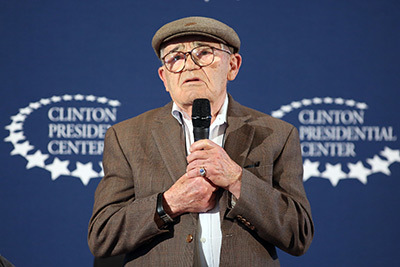 A Program featuring Holocaust Survivor Ben Stern, 6 p.m. Join us at the Clinton Center for a viewing of a powerful 30-minute documentary, Near Normal Man, featuring a first-hand account by Ben Stern. This event is sponsored by the Ben J. Altheimer Charitable Foundation. 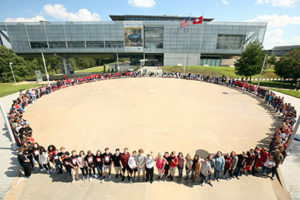 “On October 2-4, 2018, we had an amazing three days in Little Rock, AR, at the President Clinton Foundation/Library. The library tells a beautiful story of the Clinton family’s contributions including Bill as president, and the Clinton Foundation’s philanthropy around the world. There is a sapling Anne Frank Tree from Amsterdam, which is planted and growing at the Clinton Center, and symbolizes enduring hope for humanity. 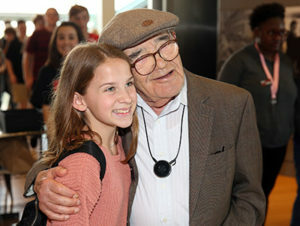 Anne Frank was a young girl who didn’t survive the Holocaust; Ben Stern was 18 when the Nazis invaded Poland — he survived. How powerful it was to have Near Normal Man screened in this setting. In three sessions, 1300 students – from all over Arkansas, learned about human responsibility in the ongoing struggle for social justice and human rights. 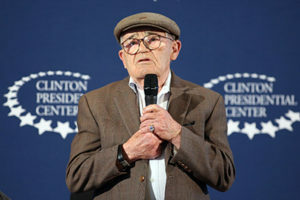 Ben Stern spoke of his personal experience, educating and inspiring audiences at all five events. Charlene Stern led a educator experiential workshop. February 16-17. Change the Status Quo: A Social Justice Conference, at Cal PolyTech University in San Luis Obispo, CA. Screening: Friday, Feb. 16 at 6pm. Conference: Saturday, Feb. 17, from 8:30-5pm. 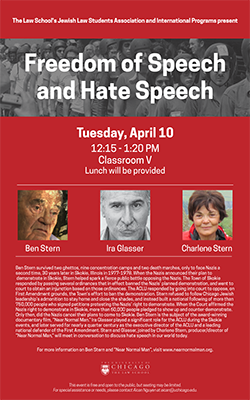 April 10 Freedom of Speech and Hate Speech. 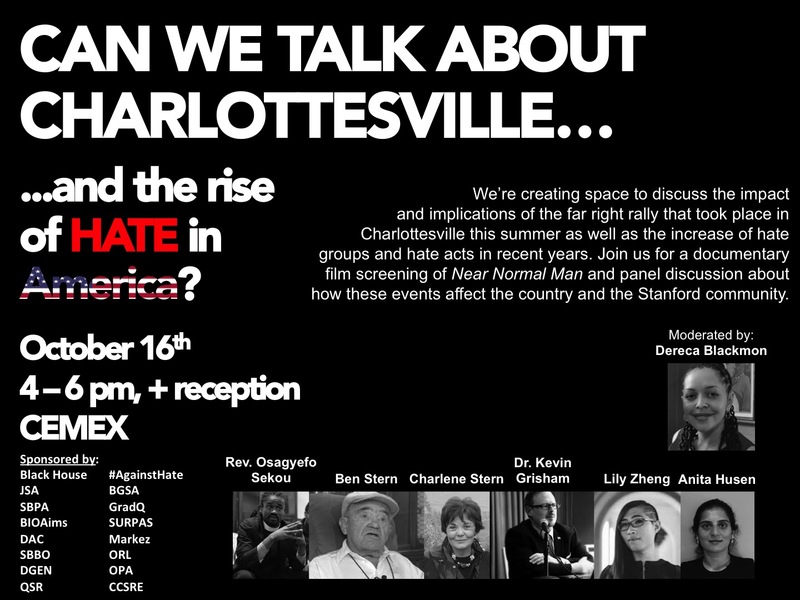 Film screening and panel discussion. Facilitated by Professor Zelda Harris, Ben and Charlene were joined on the panel by Professor Juan Pera and Professor Alex Tsesis, both constitutional law experts. April 11 Film screening and panel discussion. Facilitated by Professor Zelda Harris, Ben and Charlene were joined on the panel by Professor Juan Pera and Professor Alex Tsesis, both constitutional law experts. January 25, at 7:10p.m. at BAMPFA, 2155 Center Street, Berkeley, CA. Tickets for ‘Not Here, Not Now’ – An Unfinished Conversation” featuring the film screening of Near Normal Man and Q&A conversation with Ben Stern, Survivor and Social Justice Activist and Ira Glasser, Former Executive Director of the ACLU; with panel members, Charlene Stern, Producer/Director of Near Normal Man ; Manu Meel, Berkeley student and founder of Bridge USA; moderated by Edward Wasserman, Professor of Journalism and Dean of the Graduate School of Journalism at Berkeley. January 18, at 10-11:30 a.m. Lecture & Film with Holocaust Survivor Ben Stern at the Hearthside Lounge (Room 2313), 12345 El Monte Road, Lost Altos, CA. Free to public. 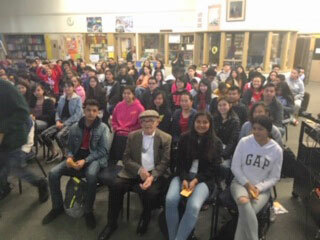 We’ll watch the Holocaust documentary Near Normal Man, followed by a conversation and Q&A with Ben Stern, survivor of nine concentration camps and two death marches. 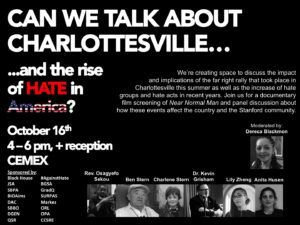 CEMEX Auditorium Can we Talk About Charlottesville…?. CEMEX Auditorium (655 Knight Way, Stanford, CA 94305). September 6, 2017, Remind.com corporate screening, SF, CA. 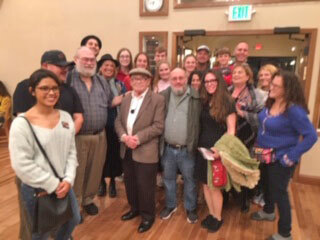 at Schultz Cultural Arts Hall, Joshman Family Jewish Community Center in Palo Alto. July 12, 2017, Colonial Theatre, Chester County, PA.
Near Normal Man premiered at the festival on February 13, 2017.